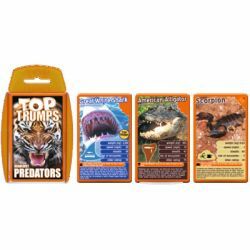 Fresh from the jungle, the desert, the mountains and the deep blue seas, Top Trumps brings you Deadliest Predators. And we're not joking, these guys are dangerous. We've swum with orcas, legged it from komodo dragons, wrestled with crocs and tickled the bellies of polar bears. All to find out whether a praying mantis weighs more than a tarantula, whether a leopard can outrun a cheetah, and whether anything has a higher killer rating than a king cobra. So what are you waiting for? Order now and by the time it drops through your letterbox, hopefully we'll have found out what noise a shark makes when you prod it in the stomach. Now, where's that boat... Grrr! Raaaagh! Hisssss! Screech! Growl! And... what noise does a Great White Shark make? We never got close enough to find out.